As an award-winning clinician, surgeon, investigator, and teacher, Dr. Griffin integrates the newest developments in the field with proven treatments to provide cutting edge, personalized care to his patients. A native of Rochester, NY, Dr. Griffin earned his undergraduate and medical degrees from the University of Virginia before returning to the University of Rochester Medical Center for his residency training in obstetrics and gynecology. He then completed his sub-specialty fellowship in Reproductive Endocrinology and Infertility at Harvard Medical School, Brigham and Women’s Hospital, where he helped pioneer the use of robotic technology in reproductive surgery. 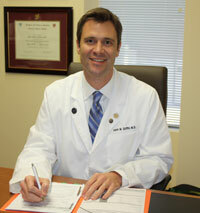 He is Board Certified in both Obstetrics and Gynecology and Reproductive Endocrinology and Infertility. Dr. Griffin most recently served as an Assistant Professor at the University of Rochester Medical Center, where he was the Director of the Advanced Pelvic Surgery Fellowship Program in Minimally Invasive Gynecologic Surgery. He also directed the region’s first Fertility Preservation Program, established in 2009, to provide fertility preservation options for individuals newly diagnosed with cancer. As a recognized expert in minimally invasive and reproductive surgery, Dr. Griffin is a leader in the use of the da Vinci robotic surgical system for the management of uterine fibroids, endometriosis, tubal factor infertility, and tubal ligation reversal. He has presented his work through presentations and lectures at several national meetings. He is an active member of the American Society of Reproductive Medicine, American Association of Gynecologic Laparoscopists, Society of Reproductive Surgeons, and the Society of Robotic Surgery. Throughout his training and professional career at the University of Rochester and Harvard, Dr. Griffin has received numerous awards recognizing his teaching, leadership, and compassionate delivery of care. Among them, he is a two-time recipient of the Arnold P. Gold Foundation Humanism Award, was an APGO Medical Education Foundation Scholar, and received the American Association of Gynecologic Laparoscopists’ Excellence in Laparoscopic Procedures Award in 2006.